Using leftover cooked and pureed pumpkin or just canned pumpkin and applesauce instead of oil, this fat-free vegan pumpkin bread recipe has plenty of flavor, fall spices and moisture, but without all of the added fat and calories. While many pumpkin bread recipes include nuts, this one leaves them out in order to keep it lower in fat and calories. If you don't mind a few extra calories when serving it up, spread your vegan pumpkin bread with vegan cream cheese, pumpkin butter or just a little bit of vegan margarine or vegan butter, or bake a double batch, and turn one loaf into a low-fat vegetarian pumpkin bread stuffing. With less than a half a gram of fat and just 258 calories per serving, this vegan pumpkin bread is virtually fat-free as well as relatively low-calorie. First, pre-heat the oven to 350 degrees and lightly grease a 9-inch bread loaf pan. Next, whisk together the sugar, pumpkin, applesauce, water and egg replacer and set aside. In a separate bowl, add the flour, baking powder, baking soda, nutmeg, ginger, cloves and salt and combine well. Slowly add the dry ingredients to the wet ingredients, stirring well to combine. Once everything is well combined, pour the batter into the prepared pan, and sprinkle a bit of extra sugar and spices on top if you'd like (optional). Bake your pumpkin bread for about one hour, or until a toothpick inserted in the pumpkin bread comes out clean. 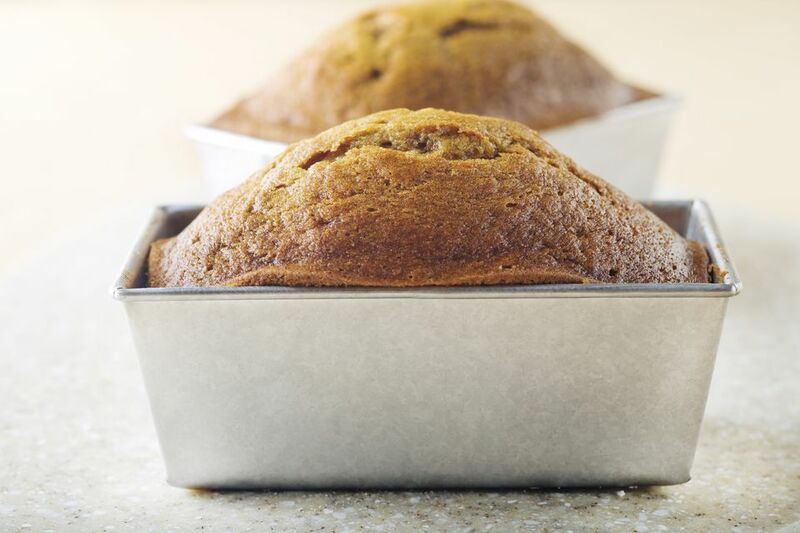 Serve your homemade pumpkin bread warm with vegan margarine or non-dairy cream cheese.